One of the issues with strata living is sometimes having to deal with other people’s messes. When condo owners Thomas and Maria experienced water damaged ceilings due to a neighbour’s flood, they had a restoration company come in to repair the ceilings. What should have been a simple job turned into a nightmare for them. The restoration company took much longer than they had expected, causing harm to their home-based business and causing them unnecessary stress. Soon after the “restoration” was finished, the ceiling texture began to crack and peel off and they were left with a botched job. They mentioned to their postman the headache they were dealing with, and he happened to know that another homeowner on his route had just had his ceilings refinished and was very pleased with them. He promised to get the name of the ceiling company for them. 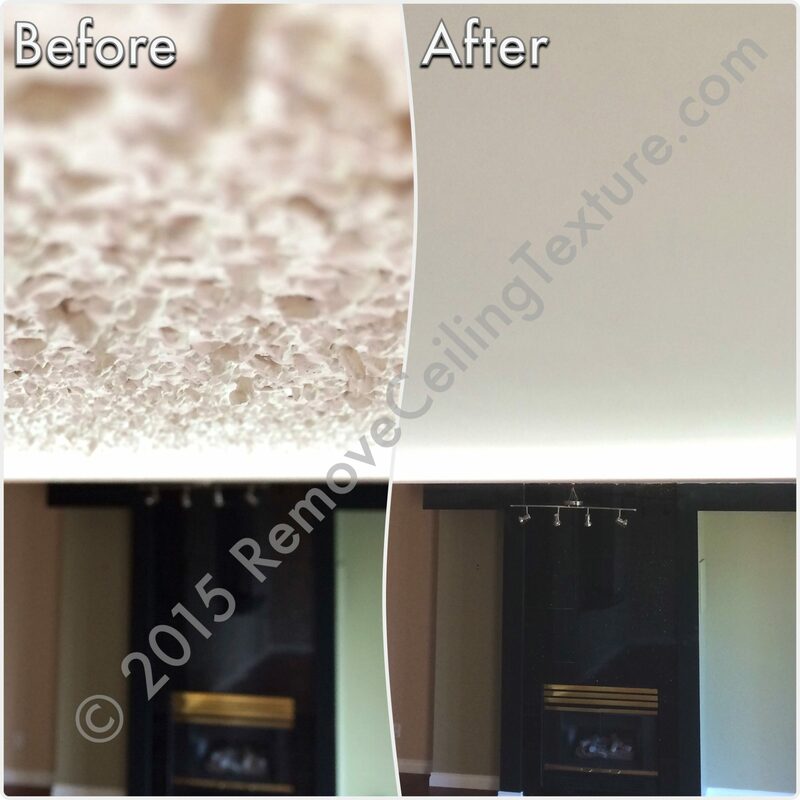 That is how they got in touch with us at RemoveCeilingTexture.com! We came in to have a look. Their ceilings really were a mess and they were understandably hesitant about more work being done. They had been promised quality work before, and the restoration company couldn’t deliver. We assured them that since we specialize in ceiling work, we have expertise that other restoration and renovation companies just don’t have. We had dealt with numerous water-damaged ceilings before and we knew we could fix their problem (read about our repair of water damaged ceilings caused by a leaky roof in Burnaby). Thomas and Maria were still somewhat nervous, but decided to have us start right away. They were finally able to relax when they saw that we did indeed have the expertise we promised. We transformed their peeling, cracked, water damaged ceilings into smooth, pristine ceilings that now look even better than before the flood. The before and after photos show the extent of damage to their ceilings. The before photos are after the original “restoration” company worked on them and the after photos are after we fixed them. Have water damaged ceilings or other ceiling problems? Click here to contact us for a free quote.